Last night was really, really hard for me to stay on track! The kids were at my parents' house, Jerry was at work, and I was bored. I'd finished my puzzle, I'm not reading a book right now, and there was nothing on TV. 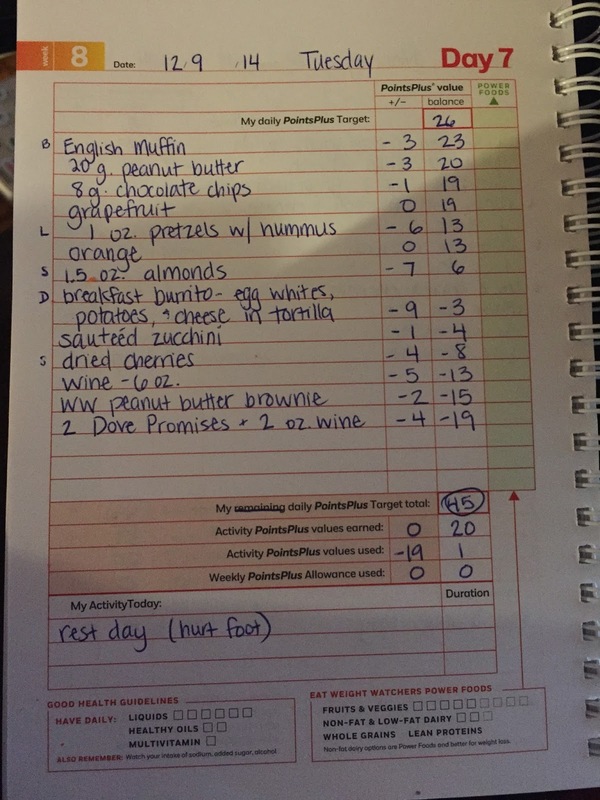 Even after I ate my snack (my usual Weight Watchers brownie and wine) I was really itching to eat. I ended up eating two Dove Promises and having two more ounces of wine. That's actually really impressive to me, because I wanted to eat an entire box of cereal ;) The only thing that stopped me was knowing that I was going to be posting my food log here--I am just really determined not to binge, because I really don't want to have to post about it. My weight was down three pounds for the week (yay!) --I guess that's what happens when I track EVERYTHING ;) Unfortunately, my foot was still really hurting this morning, so I'm still trying to rest as much as possible. It felt a little better today, but definitely still painful. When I'm not moving much, though, I don't get any activity PointsPlus, so it's going to be hard to rein it in a little this week. 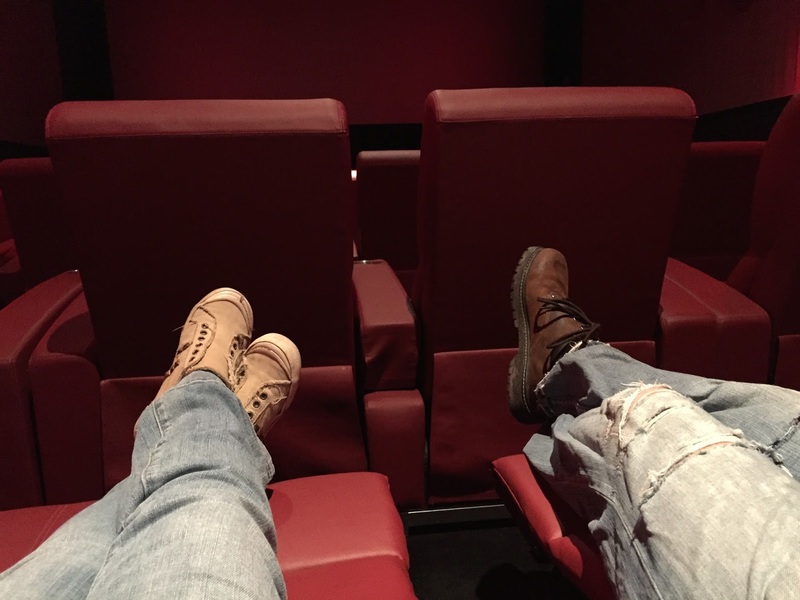 Jerry and I went to see a matinee showing of Mockingjay while the kids were at school. 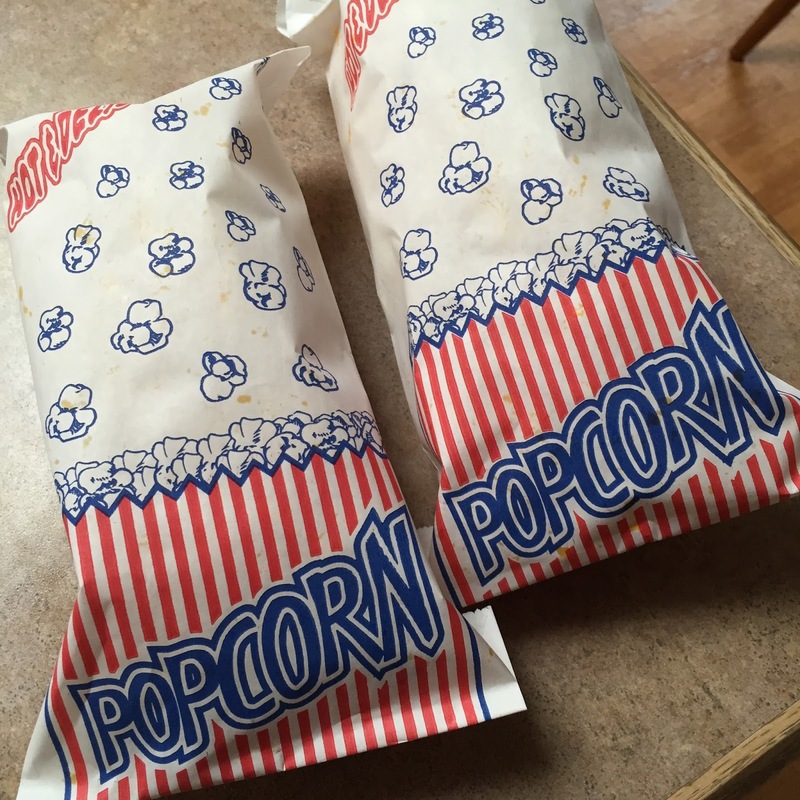 I didn't want to end up ordering popcorn at the show, or worse, a big old cookie from Mrs. Fields, so I made some popcorn at home, and then bagged it up to take with us. We attempted to go see Mockingjay last weekend, but it was sold out of two showings! We're used to being two of about six people in the theater when we go. Today, we went to an 11:50 show, and we were the only ones in there until just before the show started, and then there were about six people total. The movie was good. It didn't follow the book as closely as the first two movies did, but I liked it. I wish that the second part was out already--it's going to be hard to wait to see it! Hey Katie, I just wanted to say be careful with your foot! I've had two stress fractures this year (ugh) both in my feet, and they really stink. Not to freak you out or anything, because it could just be the aches and pains that come with being a runner… but definitely something to look out for it it keeps hurting. A stress fracture was my first thought, and biggest fear! I know it's not "normal" aches and pains--there is definitely something wrong; but I am hoping it's tendonitis, which is something I get from time to time (usually when my shoes have too many miles on them). Hi Katie, I have been following your blog for more than a year now and truly admire you as a person struggling with my weight all my life. That's why I felt sad when I read your blog today, seeing that you are still struggling with food. And at the risk of sounding condescending I would like to kindly suggest that you take a look at Mark Sisson's Primal Blueprint. I have been following the principles of primal now for 2 months and have totally got rid of cravings like this. Thank you for writing this blog. Katie, weren't you having some success with a book about overcoming binging not too long ago? This is the time of year when I have the most trouble -- my biggest work deadlines, lots of food temptations, and the holiday stress. I like to read how you're working on the same issues. It really helps. Yes, I read two really great books about binge eating: "Brain Over Binge" and "How To Have Your Cake and Skinny Jeans Too". I really need to reread Brain Over Binge, because that has been very helpful. The holiday food temptations haven't started yet for me, but I'm sure they will soon. My biggest problem is just emotional/boredom eating at night! I should start a new knitting project or something to keep busy before bed. I noticed you said your foot is bothering you a lot in the morning. Could it be plantar faciitiis? Mine flairs up when I first wake up and after sitting for a while. That was another fear of mine, but it's more on the side of my foot than the bottom of my foot, so I don't think that's what it is. It's feeling a lot better today, so I hope it's on the mend! I almost fell asleep in them yesterday! Haha, they are just as comfy as sitting at home.